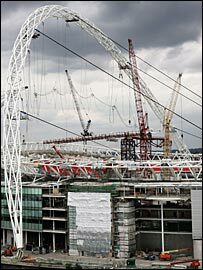 Lord Coe insists London's Olympic plans will not encounter the problems faced by the Wembley Stadium project. There are serious doubts that contractor Multiplex will meet its 31 March deadline for the completion of Wembley, following a series of delays. But Coe insists the Olympic site at Stratford differs in that funding and planning were in place from the start. 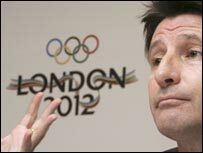 "I don't want to be complacent about this, but I see very few comparisons there," Coe told BBC Radio Five Live. "We put in place during the bid phase the two key components that to be fair were not there [with Wembley]." The chairman of the London organising committee for the Games, Coe denied that the original plans for the aquatic centre in Stratford had been discarded. "That is not true at all," he said. "This is a complex project and we will monitor every dot and comma of what we took to Singapore and the plans we will take forward. "Wembley actually came to the table without the finance in place, a lot of the planning missing and for the first three years people were sitting arguing about whether it was a pure football stadium or rugby union, rugby league - whether it would be track-and-field circuit. "We know when you build a hockey facility it is a hockey facility, there is no question about what is going in there and we have the finance and planning in place." The Football Association denied on Wednesday that a decision had been taken to stage the FA Cup final in Cardiff and insisted it would give Multiplex every opportunity to complete construction in time. Martin Tidd, Multiplex's UK managing director, previously said there was a 70% chance the stadium would be ready. But the FA has provisionally booked Cardiff's Millennium Stadium for the Cup Final on 13 May. A double Olympic champion, Lord Coe is in Turin, ahead of the Winter Olympics which start on Saturday. He is there to observe key issues like transport, the athletes' village and security. "We have a very good plan already," continued Coe. "We have an Olympic park - 500 acres where all the new builds will be. "We have 80% of athletes already within 20 minutes' travel time, nine rail lines, a tenth already up and running in a year's time, so we will almost certainly be the best connected Games. "I think the broader point to make about something like transport is that athletes come to games to be competitors, not commuters, and it's the responsibility of every organising committee. "We are not building for extravagance, but you have to give athletes the right environment for two or three weeks. "We are not wanting to give them the Ritz, but at the same time they do need the basic comforts and the basic consideration of being able to prepare. "You need to be able to sleep properly, you don't need to be two or three to the room. Those are key issues for athletes."